One of the biggest investments that most people own is their home. Keeping it looking great and something that you can be proud of is what almost everyone wants. A great looking home can be more valuable as well because of the curb appeal of the home being so much better. One way that can make your home look great is by having siding installed that performs as it should and keeps it’s appearance. And one way to keep your siding in Allen Park Michigan looking great is with siding maintenance. If you’re unsure of the maintenance requirements of your home’s siding we’ll provide an overview of what should be done in this article. When it comes to your Allen Park Michigan home, you always want it to look its absolute best. Part of keeping your home looking fabulous is caring for your siding properly. Some of those ways include a proper wash and condition treatment, and in some cases, stain or paint jobs. Care of your siding should also be scheduled at least twice per year, and possibly after heavy storms that could cause damage to your home. You should inspect your siding periodically to ensure that no damage has occurred and that your care is up to date. You don’t want to miss out on care or lose time or money if it isn’t done right. As the easiest type of siding to maintain, vinyl siding is pretty popular. Many siding installers recommend only using water and soft brushes to clean the siding boards, and to pressure wash the siding biannually at a minimum. Using soaps and other cleaning products can be harmful to the life expectancy of your vinyl, so avoid those to keep the shine on your home. 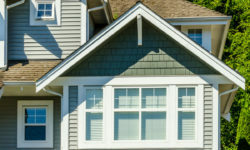 You should also check your siding occasionally to be sure that none of the boards are loose, cracked, or broken. When in doubt, always contact your installer to take a look at your concerns. 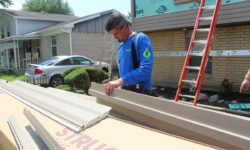 They can ease your mind with their expert knowledge about your siding. Be sure to look for cracks in the Winter as well because vinyl siding is more prone to crack during colder weather when it’s more brittle. Wood siding requires a bit more care than vinyl. Wood siding looks absolutely amazing on a home but there are some huge drawbacks to having it installed and one of those drawbacks is the maintenance requirements to keep it looking great year after year. Wood is a porous material, so it immediately becomes more susceptible to weather, insects, and other damage. Because it is porous, it requires stain, paint, and sealant to extend its life. Wood siding still needs to be cleaned regularly, just like vinyl siding, but the processes are a bit different. If you have wood siding, you should have a professional repaint or stain your siding every four years or so. You’ll also want to regularly inspect the wood for damage, cracks, and other issues. Because wood expands with heat and contracts with cold, it’s possible that any paint may chip or crack, and that may allow the elements to affect your siding. Be sure to have your installer inspect and fix any issues you come across. You wouldn’t want moisture to loosen the caulk at the seams because that can cause future damage, including wood decay. Who are we kidding? Homeowners are busy people with jobs, lives, and families. They don’t always have time to make proper inspections of their own homes. That’s where we come in. Professionals know how to best take care of your siding. We will come to your home and make sure that all of your siding is properly cleaned, fixed, and cared for so that you never have to worry that your wood or vinyl siding is subpar. Trust us to wash your vinyl siding, stain or paint your wood siding, and make sure that you don’t have to worry about damaged siding. We will keep your home looking absolutely amazing. 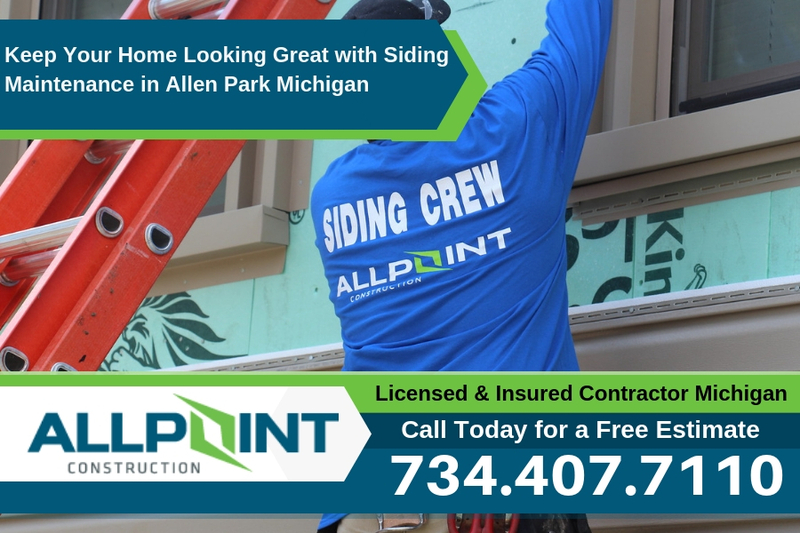 One of the best siding contractors in Allen Park Michigan is All Point Construction. Call them today at 734-407-7110 for details about inspecting your home’s siding. NextWhy is Your Roofing in Dearborn Michigan Fading?